Club Penguin Cheats by Mimo777 Club Penguin Cheats by Mimo777: Mimo's Secret Club Penguin Hangout Spot Revealed! So ya, you know I get mobbed pretty good when I go on Club Penguin. So here's the deal. Let's see if you can pick out my secret spot! If you can guess which of these is my secret spot I will have a PARTY! Vote on the poll over on the left. If you pick the correct secret spot I will have a Mimo Quickee Party at the secret spot location! I will reveal my secret spot THIS WEEK! The first one is in the Mine, the second is the Beacon and the third is the theater. Your favorite is the the beacon? Yep! Which one do you think is his hiding spot? Vote on the poll now! You're not trying to get the location of the pictures. You're trying to guess which one is his hangout. I say the mine because it hides his name. but.. the third one is a good choice to, because you said you also "watch", and the stage has a lot to be watching. everyone dont awayspick the ovious one which is trying to be hiden. It may be it but think isnt that so obvious. Hey People, Im here to prove my decison on which place it is. The first one doesnt work because the thing blocking his name is the Spy Phone. Note that only Agents have the Spy Phone. So if someone wasent an Agent, they could spot Mimo and it would cause and uproar. The Second One dosent work because the yellow light from the beacon light, because it is yellow, makes the black letters of Mimo's name stand out. People would notice. Its the third one because the color of where he is, makes the black letters of Mimo's name blend in. Making it only possible for someone to notice him of they click on him or look at the users in room. "Join Club Penguin Green Team, click my name!" Mimo hasent said his favorite yet. Just because people mostly voted on one dosent mean it couldnt change. So, Mimo will tell us later. "Please Join Club Penguin Green Team, Click My Name!" Yeah, might be, but #2 is also a contestant! I am gusseing it is the Mine. It may be the theater because thats the only place that Mimo can sit and watch the plays. My epic guess will be secret spot number......1 that is my guess mwa ha ha ha ha ha! I'd say that it is the stage because you can sit and watch everyone. I think the stage because u cant see there name. YOUR FAV IS #3 the stage!! i can't choose lol! Can i vote all of them? one second mimo if the spot u stay in secret then why make us guess for it i think none of them are ur secret spot and that ur secret spot is somewhere else!!!! i say the show room thing coz i hide there. 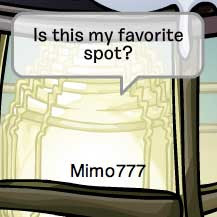 Um... Mimo, you wrote "secret spot" on the blog but on the pics you wrote "favourie spot". Has anyone else noticed this? By the way... pic 1 is mine, pic 2 is lighthouse beacon, and pic 3 is stage. PLEASE POST COZ U ROCK MIMO!!! "Join Club Penguin Green Team, click my name! I think its three because the other 2 we can see ur name! on 3 it blends in. i voted for tha mine! I would say nr. 2. Good luck to every one :). the third one at the stage! come on it's #3 can't you see that number #2 is Edited in Photoshop. p.s. try putting your name on the black bar behind the light to make it harder for ppl to see who is there! I Thinks Its Secret place TWO! its a hiding place and you cant be seen! I think its the stage because mimo said its where he watches people. I think it is the 2nd one.You cant be seen. its number 1 he said sit down and hide and WATCH!!!! I think it's the Mine area! I'm guessing the beacon. I'm sure of it. I have two penguins JImmy7780 and Mustard88. the anwer is,1 mine 2 beacon 3 stage. Have a huge PaRtY MiMo777!. I have a better hiding spot where you can't even see your own username. But you have to go into the hiding spot carefully. If you want me to tell you just reply in a comment. The first one is ur favorite. its the first one, easy peasy. The Mine, duh. I see you there all the time. I'm pretty sure it's the beacon, cause u cant see your penguin. I agree with Laurel A.
if it was #2 then you can hide ur name under the bar so its harder to see. It's got to be spot #2!! Great you know where they are but which one is mimo's fav? That's great! Now which one do you think is mimo's favourite? Does anybody know what server he will go on for this secret party? P.S.If ur reading this mimo can you answer this question? Hey Peeps! It's me!,Smiles23500! i'm pretty sure mimo777 told me it's the beacon #2!!!! Trust me! My second choice would be the stage, though! Cmon! Vote beacon#2! P.S. : If u see me anywhere, add me! Or recks124 said i think its number two because it seems like a good spot to sit , chill and hide ! I say #3 because it's the most obvious so no one looks there. I think none because if it's secret you wouldn't tell us!!! The second one is Mimo's favorite spot because the light makes you piratically invisible. The Mine is not the one because you can be seen by other penguins. Then, in the theater, it's sort of hard to get there but I think it is to obvious to be seen. By the way, I only play Poptropica and Club penguin. I don't know why though. If he wasn't a secret agent, then the Mine will not be the answer. I think the Beacon because you are practically invisible. But, his name will be shown. Still I'll chose the Beacon. The Stage is not the answer because you can easily spot him. But the Mine is usually empty, or less crowded. Ever since the Mine had Cart Surfer and the new game, it is more crowded. But remember he only goes at night or earlier morning. so its pretty hard to decide. Well, I'll chose the Beacon anyways. Cuz it doesn't really give you away (except for the name). Your favorite spot is the theater because u said u would like to sit hide and WATCH!!! I think Secret Sport #2; The Beacon because personally, that light is pretty rad. Oh, and I know you didn't ask for it, but option 1 is the mine, 2: the beacon, 3: the theatre. 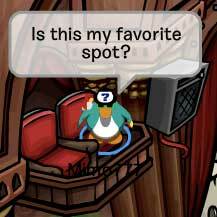 I guess your favorite is #2.The spots are mine,lighthouse top,and theater. I'm going to guess the 2nd one! it is the third! Remember he likes the act like a ghost in the wall! the third is harder to see your name. the second one you can't be seen but your name is easily and it is a common hiding spot. the first is quite hard to see you name.But, you are very visible. The order the hiding places are in are Mine, Beacon, And the theater. I would hide in the Mine or Theater. P.S. My penguin name is Kintocam. Good. Now can you choose a spot? I'd say the Mine or the Theater. ~The Mine because when you hide there, no one can really see who you are unless someone clicks on you. 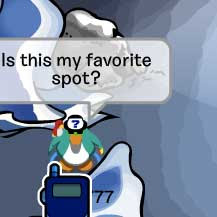 You can also hide there where your penguin is BEHIND the Spy Phone and if you sit in a certain position, no one can see your user, your penguin, or even click on you unless they know it's a hiding spot. I've hidden there a million times and it always works ;D. Since there is a little piece of (rock or is it ice?) in the pic, it also hides your penguin very well. It also hides your user a little bit so it looks almost "blurry" if you know what I mean. Then people can't see you. Plus, I see TONS OF RANDOM PENGUINS JUST SITTING THERE AND I SOMETIMES CAN'T SEE THEIR USER. Oops, that might have "hurt your ears Mimo777". I'm gonna say the beacon. Sure people can see your name, but its a good hiding spot for your body! My favorite spot is in the forest behind left tree on the bottom.